It is hardly necessary to remark that selling and buying of produce and goods dates back to the beginning of civilization. However it is both instructive and entertaining to see how these methods of trading were managed in our historic past. English towns grew largely as centres for trading and commercial activities and the provision of suitable areas within them, such as market places, were integral in their development. What is less easy to explain is why Edward III “in 1468 gave the monks of Beaulieu a weekly Thursday market within the precincts.” I think it may indicate that a settlement was by that date established in Beaulieu and the that there was a need for a market but the burgeoning village, being ad hoc, had no administrative mechanisms itself to regulate trade so the right was granted to the Cistercian monks. As towns developed so they, to some extent, competed with one another. Each needed to ensure that the traders and merchants dealt fairly with their customers as a reputation of poor dealing would ensure that purchasers travelled to other towns to conduct their business. So the integrity of the town was of great importance and was strictly regulated by the manorial courts. Last year, you may recall, a great fuss was made about commemorating the importance of Magna Carta and what it meant for our freedom but I did not hear of one mention of clause 35 which states that there must be one standard set of weights and measures, for beer and ale and for goods. This was to ensure that a universal standard was applied throughout the kingdom. A clause which was vital for properly conducted trade. The various manor courts, such as View of Frankpledge, ensured this was carried out and that offenders were fined for breaking the rules as happened to the Christchurch baker, George Clement, who on 18 July 1543 was arraigned for selling bread underweight and fined 3d. A small enough fine but think what it may have done for his reputation! This brings to mind the fact that Lymington butchers were reprimanded in 1795, a time of scarcity during the war with Revolutionary France, for selling their meat at a higher price “than those of Ringwood, Christchurch, Poole or any of the Neighbouring Towns.” And to compound this accusation they also obliged “Customers to take considerable quantities of what is called Rough Meat, to be weighed with the Prime” a practice apparently adopted uniquely by those in Lymington. Markets were established by a grant being awarded by the monarch to the local lord of the manor or, where appropriate, the corporation, defining the right to hold a market and specifying the day or days on which it should be held. 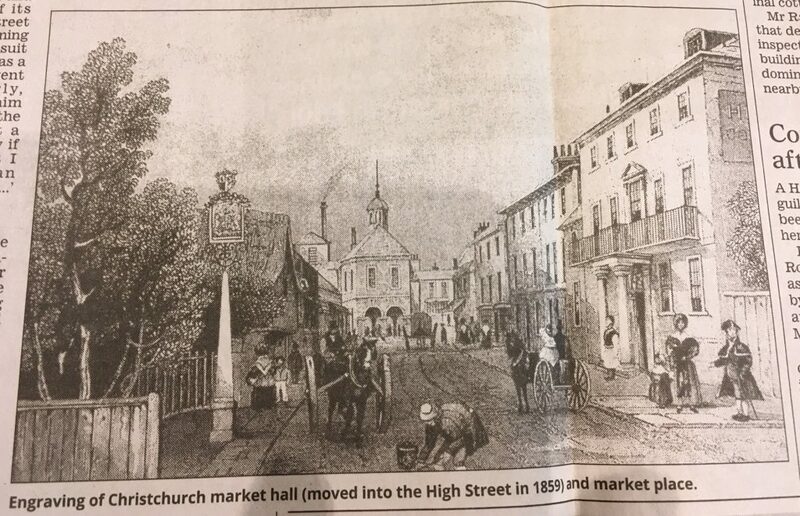 So for both Christchurch and Lymington the grant of the right to hold a market was made by Henry III, who reigned 1216-72, to the lord who held both towns, namely, Baldwin de Redvers. For those interested in exploring this subject should read the first rate account given by David Eels in his booklet, ‘The Medieval Markets and Fairs of Christchurch’ (Sept. 2008). Often the right to hold a fair was granted in the same charter that also authorized the market. 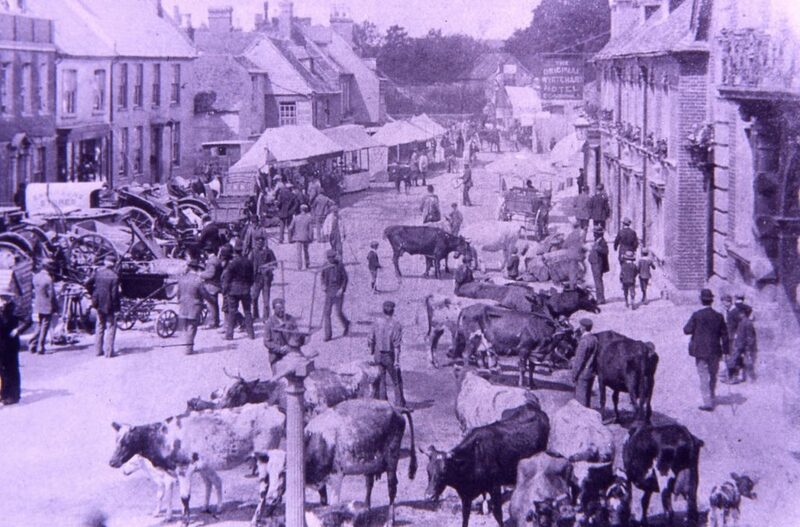 Lymington’s market was to be held weekly on Saturdays and the wide street formed when the borough was created was designed to accommodate the stalls of the traders who were to pay a rent for use of the booths. The corporation had to make payments for the supply and maintenance of stalls as it could not be expected that traders would be able to bring such accoutrements in addition to the wares and produce they had to offer. Just to give an example, the accounts for November 1616 ‘2 planks for the fish shambles 2s. 6d. (and) setting up the planks and work about the market house 2s. 6d.’ They recouped their costs by levying a small rental on the tradesmen selling goods on the stalls. Originally fairs were held once or twice year at a number of locations around the country. Their prime function was to encourage traders from far off places to bring their wares or goods for sale and in order to accommodate them the fairs were mainly held on three consecutive days. “Like the market, the fair was a highly prized source of profit and one which sovereigns were prepared to bestow for a suitable payment. That astute man of business Bishop Walkelin of Winchester obtained from William Rufus the grant of three days’ fair on St Giles Hill, the proceeds of which helped him to complete his magnificent cathedral…after his death the fair continued to prosper,” to an extent that allowed its extension to two weeks and then to 24 days. Lymington’s fairs were held twice a year in May and October, as Charles Percy Jones states, “Until the coming of the railways, these fairs were of immense importance not only to the inhabitants of Lymington, but to all living within a circle of many miles around, and even in other counties.” (“History of Lymington”, 1930). Jo Ivey as editor of “Showpeople of Hampshire—Celebrating the History of Fairs and the Fairground Community in Hampshire” (Hants County Council, 2013) provides an excellent summary of the history of fairs in chapter 2 though the story is primarily the oral history of the pleasure fairs in the county. It is difficult to discover the precise origin of retailing through permanent premises, though it is evidently quite ancient, such places then became known as shops. In many towns there is evidence of the market stalls gradually becoming transformed into permanent booths and then into shops. Initially these premises it seems were limited to the sale of items made on the premises such as shoes and clothing, leather wares, which included jugs and buckets; bakers baking bread, candlemakers and pottery though there are no immediately local examples of the latter. Following the Restoration of the monarchy in 1660 there was a period when small change became very scarce so that trading was made very difficult. Even though the practice was illegal, ever resourceful, the retailers took to manufacturing their own coinage not as replicas of the government specie but impressed with their names or initials, the date of issue and the value which was almost always, a half penny (½d.). This ‘coinage’ in general is known as traders’ tokens. Many give or otherwise indicate the occupation, for example, the token of John Harmood of Lymington shows a man making candles and Richard Belbin of Ringwood has the impression of a sugar loaf on his half penny. Some of the local inns issued these tokens and displayed the appropriate coat of arms on the little coin, for example, the innkeeper Henry Rogers at the King’s Arms in Christchurch. Indirectly these tokens give some indication of the vitality of retail trading and what does emerge overall is the high proportion of grocers represented by tokens which had, even by this date become one of the main retailing businesses and, indeed, have remained so to the present day. The traders’ tokens provide a valuable insight in to commercial life in our market towns in the late seventeenth century. Collections of them may be seen in the Red House Museum in Christchurch and in St Barbe’s in Lymington. It is difficult to find references to shops in villages and outlying parts of parishes before about the mid-nineteenth century but from around that time such outlets proliferate. Such businesses were made possible by the rapid development of manufacturers, such as Cadbury, Players or Wills, Crosse and Blackwell, Tate and Lyle and Heinz and a host of others who produced goods in bulk coinciding with first the improving road systems and, more significantly, the development of widespread railway communication from the 1840s onwards. 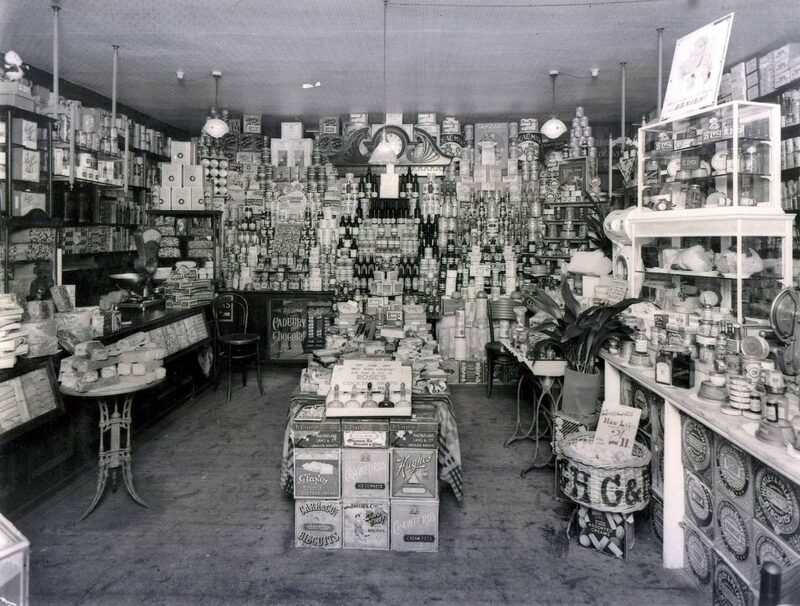 Such commodities often came in convenient packing (tins, jars, cardboard boxes and so forth), had a long shelf-life and were well suited for display and sale in smaller premises as well as the larger stores in our towns. Rattles thieving birds to scare. Gathered warm that very day. When I went to shop for mother. For over a century these village stores served their village communities with the necessaries of daily life but now, sadly, largely are gone. This article was written by the President of the LDHS Jude James. We are grateful to him for allowing us to use publish it on our website. It should be noted that this was first published in the New Milton Advertiser and Lymington Times on 2nd July 2016.